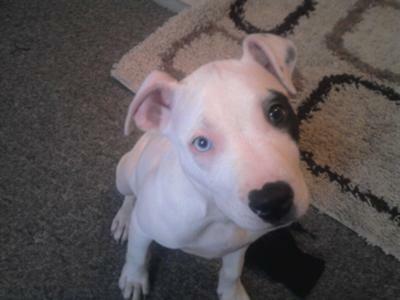 My dog's called skye she's an am pitbull. she's 1 year old. when she was only 5 months she was stole on me. it took me a week 2 get her back. Then a month later the local council dog wardens came out with a search warrant cuz the said they had a complaint that i was fighting and breeding pitbulls which was so far from the truth. 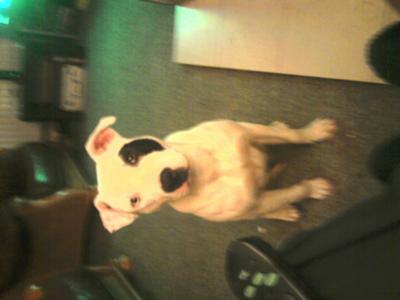 the only dog i had was my own family dog skye which they believed 2 be a pitbull type dog. At the time it was illegal 2 own a pitbull type dog where i live (belfast northern ireland). so they took her from me and kept her 3 months with the intentions of putting her down (killing her). I fought the case and the local dog wardens brought over from england a so called "specialist" in pitbull type dogs. 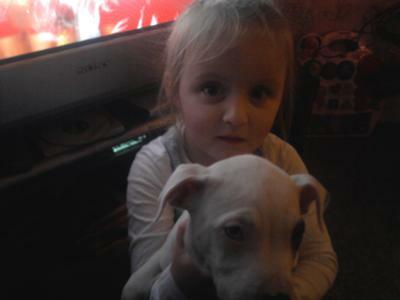 previous 2 this on christmas 2009 the local dog wardens also took my dog's father a big beautiful red nose pit. so when the dog wardens brought over their specialist, he actually saw both the father and my dog its daughter on the same day and his decision was that my dog wasn't of pitbull type but the father was. it was ridiculous. I now do have my beautiful dog back where she belongs in her family home. and her father we are trying still 2 get him back which we should in the next couple of weeks fingers crossed. well first i have to say ske is sooo beautiful. 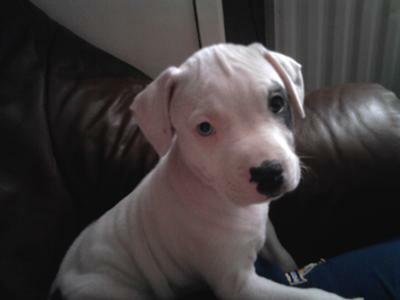 my first pitbull puppy was all white with black spots on his belly. my 2nd buddah who i have now is a choclate brown they are the best dogs in the world we have had so many diffrent breeds & my pit's were the best. Good luck i hope you get your other one back. it is so sad the way the law works how you can judge a dog by its breed makes me sick. if people were more educated & read the books & listened a little more about all the good things about ptbulls they would change there minds they are so loving so devoted. they are the best would have 10 if i could.